Let’s be honest, roofers are a dime a dozen in Miami. It’s the land of sunshine and extreme heat, of hurricanes and sporadic torrential downpours. This sets the perfect scene for roofing companies to thrive and for leaky roofs to form. Nowadays, anyone can easily find a roofing company near them by performing a quick online search, and those roofing companies can probably get the job done at a price point you’re comfortable with. But have you considered what goes into making a roofing contractor safe and promising to work with? At the end of the day, your roof is supposed to protect your precious loved ones and belongings. It is absolutely necessary to do your homework prior to hiring a roofing contractor to perform roof repairs or a roof replacement on your property. These five tips below will be sure to guide you in hiring a reputable roofing contractor who is backed by a strong history of success. First things first, is the roofing company you are considering licensed and insured by the State of Florida and backed by personal, property, and workers’ compensation insurance? Always ask for proof of insurance prior to hiring a roofer. This protects you, your home, and valuables from being at risk of job-site accident legal issues. Construction is a complicated industry involving many moving parts and systems. Roofing is ranked as the fourth most dangerous job in America by TIME magazine (source: TIME Magazine 2016) and for good reason. Perkins Roofing is a dual-licensed and insured Florida roofing contractor since 1980 (CCC042786 & CCC1331944) and takes job-site safety seriously. We are also proud members of the Florida Roofing and Sheet Metal Contractors Association (FRSA) and the Roofing Contractors Association of South Florida (RCASF). It all starts with honest answers to your roof repair questions and transparency when talking scope of work and pricing. The fact is, most homeowners distrust contractors and we can’t blame them. The Better Business Bureau unfortunately ranks roofers as the most untrusted profession and a lot has to do with the fact there are many unlicensed and uninsured roofing contractors running around town (see point number 1). Perkins Roofing takes the time to thoroughly explain all roof work estimates to customers and only suggests services absolutely needed to be done to maintain the health of your roof. The transparency doesn’t stop here- we pride ourselves on constant communication from initial estimate, to estimate arrival time, to job progress updates, and final completion. Clear communication benefits both parties. We set high expectations for our team in order to serve our customers to the highest level of satisfaction. All roof work should be backed with contractor warranties and product warranties. It is essential your roofer offers warranties for all roof work performed to ensure you are covered in case of an accidental roof leak or product malfunction. Perkins Roofing offers generous roof warranties and all jobs are performed by qualified technicians and top-quality materials. We work closely without our trusted product representatives to only supply the best materials to our customers’ homes. If a problem should arise with your roof, contact us and we will gladly dispatch a crew immediately to solve any roof issues. Perkins Roofing always offers competitive pricing to customers and all types of roofing projects. From high-rise condominiums, large government warehouses, to residential homes, you can count on us to offer reasonable and affordable pricing. But remember, a cheap roofer probably means cheap work. Never hire a roofer based solely on price. Inexpensive roofing bids hurt the overall market and drive down the health of the construction industry. An established, trustworthy roofing contractor with proper insurance, licensing, equipment and materials must have accurate pricing to cover necessary costs in order to do legit business. Hiring a roofer based only their inexpensive cost most likely sets you up for spending more money in the long-run on unforseen recalls and headaches. Always hire a reputable, competitive-priced roofing contractor. 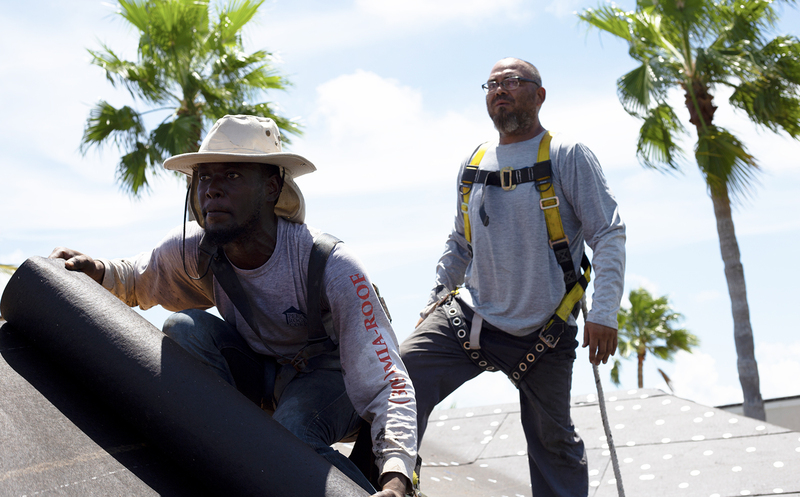 There’s a good reason Perkins Roofing has been South Florida’s trusted roofer since 1980! Always look for an established history and a positive reputation when scouting out Miami roofing contractors to hire. Most of the time, online reviews don’t lie and familiarizing yourself with what’s been said about the roofing companies you are considering can give you an idea of what it’s like to work with them. Starting a business is easy, but running and maintaining a well-functioning roofing company that puts customers first and fosters a positive work environment for its team takes effort. We’ve always been up for this challenge.